One of the (many) things I like about Adam Robert's stories is that they are always full of big ideas and The Real-Town Murders is no exception. This time the author has written a future-noir crime story which revolves around the "locked room mystery". A popular subgenre in it's own right, "locked room" mysteries explore a crime (usually a murder) which has been committed without any visible means of detectable entry or exit. In The Real-Town Murders this involves a body being found in the boot of a car that had just been built entirely by robots in a completely automated factory constantly monitored with cameras covering every angle and without any allowed human presence (until the final inspection where the body is discovered). Private detective Alma is hired by the manufacturers to try and find out what happened. In this near-future England, most people spend their time in Shine, an immersive virtual reality that has replaced the internet. With the population constantly plugged-in - they even have robotic walking frames so they can stay immersed while the body gets exercise - England society is crumbling. Alma can't immerse herself like others, even if she wanted to. Her bed-ridden partner Marguerite has an engineered virus that is gene-linked to Alma and as such only she can treat. Every 4 hours she must figure out and administer a treatment within a 5 minute window or her partner will die. The virus however has not affected Marguerite's mind which is sharp as a tack and something Alma occasionally relies on to help her solve more complicated crimes. So we have an impossible murder set in a fairly grim near-future with a detective who has to make sure she can get to her partners side every 4 hours without fail, all told with Roberts intelligence and liguistic flair. Hard-boiled science fiction noir in Robert's style works exceptionally well. The future described by Roberts is an all too likely one, the natural progression of a commercialist society. Games, smartphones and the internet cumlinating in Shine. People switch off from the real world to immerse themselves in a 24/7 virtual environment. Those who are forced to deal with actual real people find they've lost touch with social skills and verbal communication. Much of the country is run by AI and personality constructs. It's the human element that still cause most of the problems however. Robert's prose, as ever, sparkles and the big ideas this time include how to control and govern an automated, connected but socially switched-off society along with the nature of identity along with the ineviatable consequences that come with the continued march of commercialism. It's a fast-paced, engaging read that doesn't sit still for a minute. I loved the fact that the author didn't write more than he needed. He keeps the story progression on track and as a result fits the entire story into a reasonable page-count. Refreshing when surrounded by books large enough to be used as house bricks. 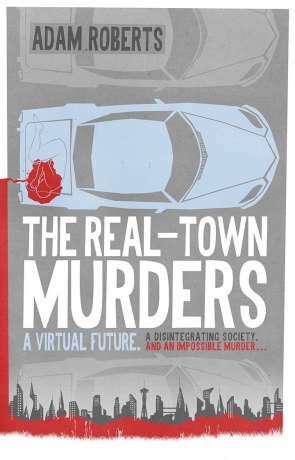 The Real-Town Murders is thoughful, clever and effortless fiction that successfully blends hardboiled noir with near-future scifi to create a rich, rewarding story. Highly recommended. Written on 24th July 2017 by Ant.